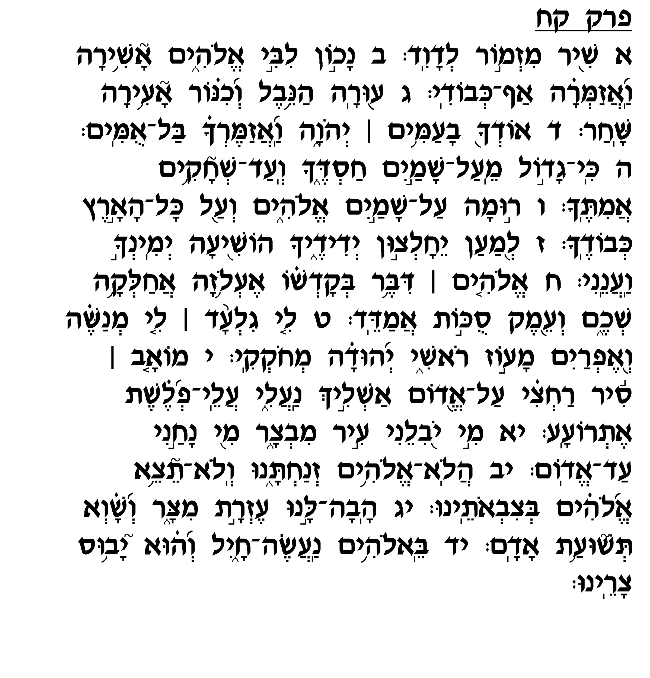 Psalm 108 is essentially a composite of two sections that appear already in previous chapters in Tehillim. The first section (verses 2-6) bears close resemblance to the closing section of chapter 57, a prayer that David composed as he hid from King Shaul in a cave. In these verses David expresses his desire to sing God's praises and even to arise in the middle of the night for this purpose, to thank Him for rescuing him from his foes. The second section of this chapter (verses 7-14) appears in chapter 60, where David praises God for granting him victory over the enemy nations of Aram Naharayim, Aram Sova and <?xml:namespace prefix = st1 ns = "urn:schemas-microsoft-com:office:smarttags" />Edom. David humbly acknowledges that it was God who enabled him to defeat these powerful enemies, in fulfillment of His promise to grant David dominion and prowess over the surrounding nations. The Radak (commenting to verse 1) suggests that David combined these passages to form this Psalm as a song of praise for the Messianic era. David prophetically foresaw the tribulations that Am Yisrael would endure in exile and which would very closely resemble the challenges and troubles he confronted himself. The Jewish people would be forced to flee from enemy pursuers and wander from place to place in search of safety, just as David spent a number of years hiding from King Shaul. And just as upon ascending to the monarchy David had to wage fierce battles against relentless enemies to secure the nation's borders, so will the Mashiah lead the Jewish people in battle against the oppressing nations. Appropriately, then, the songs he sang to praise God upon achieving personal salvation are now used as expressions of praise for time of Mashiah, when we will thank and praise the Almighty for delivering us just as He had delivered David from his adversaries.